acWaC-EU is a 90-million word corpus of web pages in English crawled from the websites of European universities. The universities sampled are based in countries where English is or is not a native/official language, hence this (monolingual comparable) corpus affords comparisons of native and lingua franca (ELF) varieties of English in the institutional academic domain. country where the university is based, European Union membership (yes/no), and language family of the official language spoken (e.g. France/Romance, Norway/Germanic, Russia/Slavic, etc.). This page provides information on acWaC-EU and the scripts that were used for its construction. In the near future the corpus will be made available as a set of n-grams, along the lines, e.g. of the Google Books N-gram dataset or the Rovereto Twitter N-Gram Corpus. Stay tuned! Ferraresi, A. and Bernardini, S. (forthcoming). The academic Web-as-Corpus. In Evert, S., Stemle, E., and Rayson, P. (eds). Proceedings of the 8th Web as Corpus workshop (WAC-8), Lancaster, UK. The table below presents detailed information on the contents of the acWaC-EU corpus. 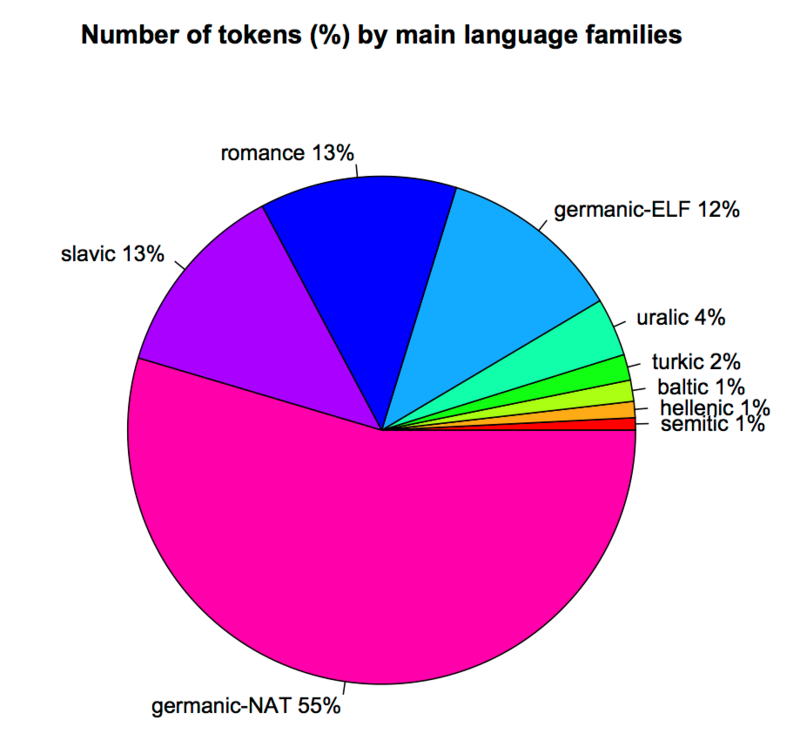 The plot below shows the number of tokens (in %) for the “main” language families featured in acWaC-EU (i.e. those with 500K+ tokens). the postprocessing scripts (adapted from the scripts developed within the WaCky project).